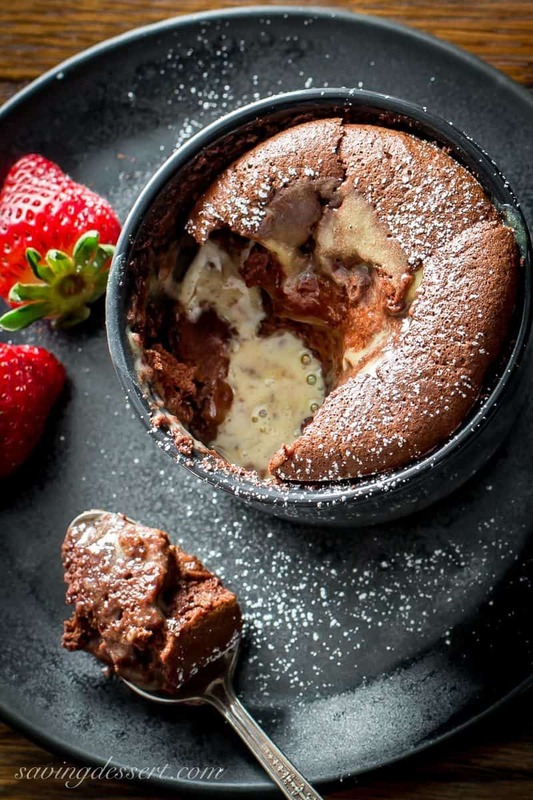 Light as air, and melt in your mouth creamy, our Chocolate Soufflé with Bailey’s Crème Anglaise tastes luxurious and couldn’t be easier to make! Chocolate and romance go together so well, it’s hard to think of making anything else when trying to impress that special someone you love. 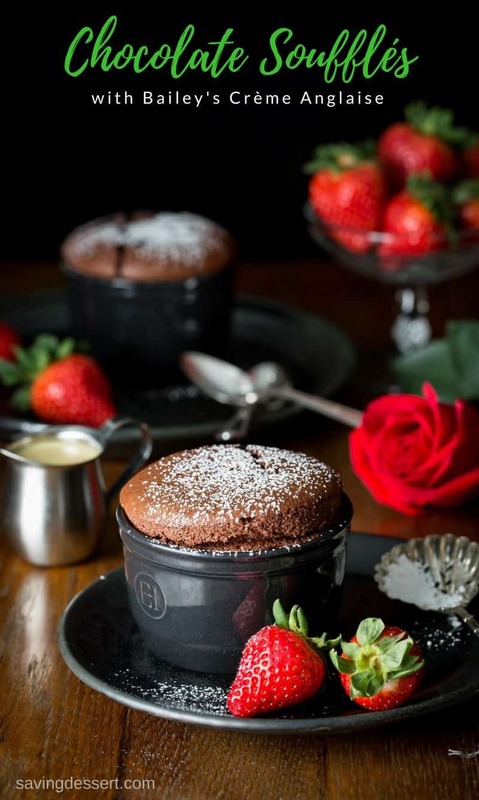 Don’t get me wrong, our recipe for Chocolate Soufflé with Bailey’s Crème Anglaise is a great ending for any special meal, not just for anniversaries or Valentine’s Day. This dessert is perfect whenever you want to make a great impression or do something nice for a special friend or family member. Everybody has somebody they feel great affection for, so don’t think you have to be attached, married or engaged to make this luscious dessert! 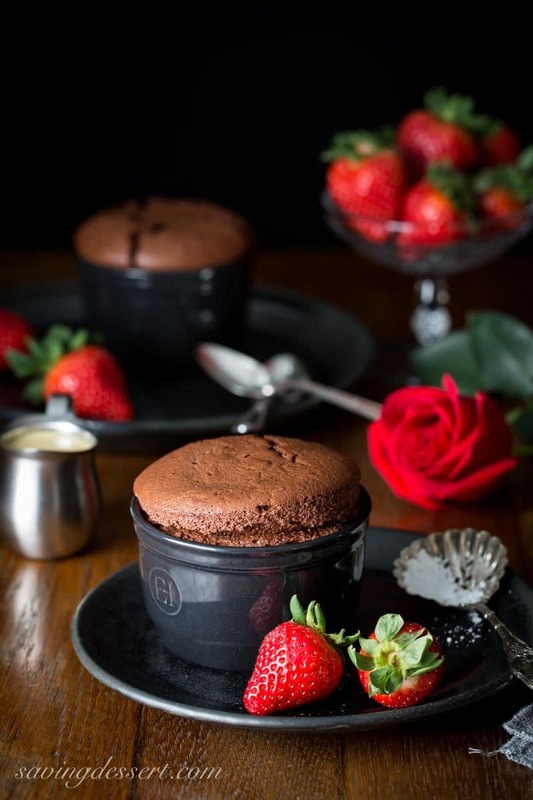 But … if you’re planning a romantic evening, these soufflés are the perfect ending to a fantastic meal – not too sweet – and your dinner guest(s) will feel pretty special. It’s pretty hard to capture the ultimate soufflé puffiness on camera. As soon as they come out of the oven, they start to deflate. But that doesn’t change the incredible texture you’ll find when you dig in with a spoon. Soufflés are done when the tops are dry and the centers are still jiggly. Don’t over bake the soufflé or you’ll end up with a delicious cake-like brownie. That’s not necessarily bad, but not near as good as the creaminess you’ll find in a perfectly baked chocolate soufflé. To serve, dust with powdered sugar or cocoa powder, or a dollop of whipped cream, or our Bailey’s Crème Anglaise, which I highly recommend! Easily made ahead, our rich and velvety Bailey’s Crème Anglaise adds a lovely contrast to the rich, chocolatey pudding. This is our go-to recipe for a creamy Anglaise sauce. You’ll find variations served with our Apple Bread Pudding with Apple Brandy Sauce, and this easy Irish Apple Crumble Cake with Apple Brandy Sauce. You don’t have to use Bailey’s Irish Cream in this recipe, any Irish cream will do. We are big fans of Bailey’s and highly recommend grabbing a bottle. We have a few more recipes coming up, all with a little Bailey’s added into the recipe. So if you’re baking along with us, you’re going to love having it on hand. This is what happens when I get a bottle of good brandy or Irish cream, the inspiration just keeps coming! Soufflés originated in France in the early 18th century. Made with egg yolks and whipped egg whites, soufflés can be either sweet or savory. 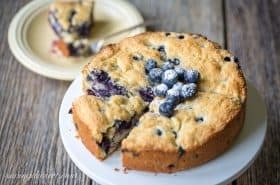 The French word ‘soufflé’ roughly means ‘to puff’ or ‘to breathe.’ So even though these lovely desserts may look heavy, they’re really super airy and light but with so much flavor it’s absolutely hard to resist. For comparison purposes the end result is more like a cross between a light, fluffy pudding and gooey warm lava cake … dreamy I know! 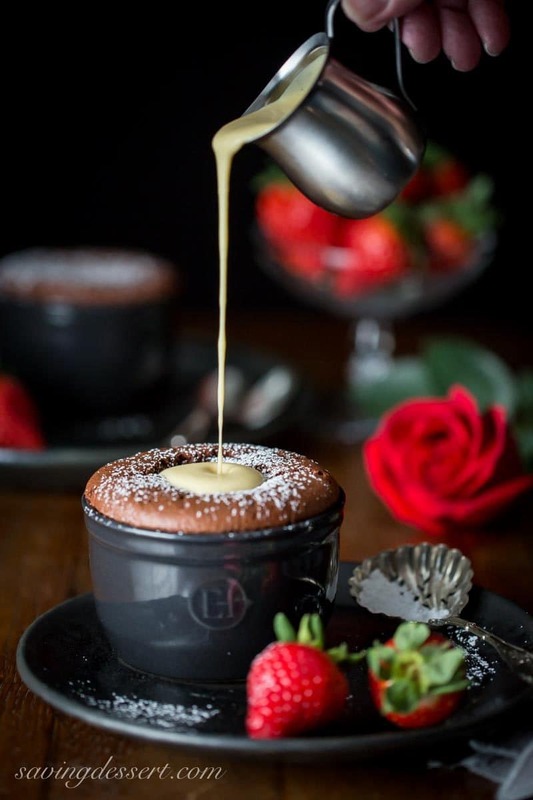 Generously drizzle the chocolate soufflé with the Bailey’s Crème Anglaise and dig right in. Moaning is perfectly acceptable while you savor every bite. 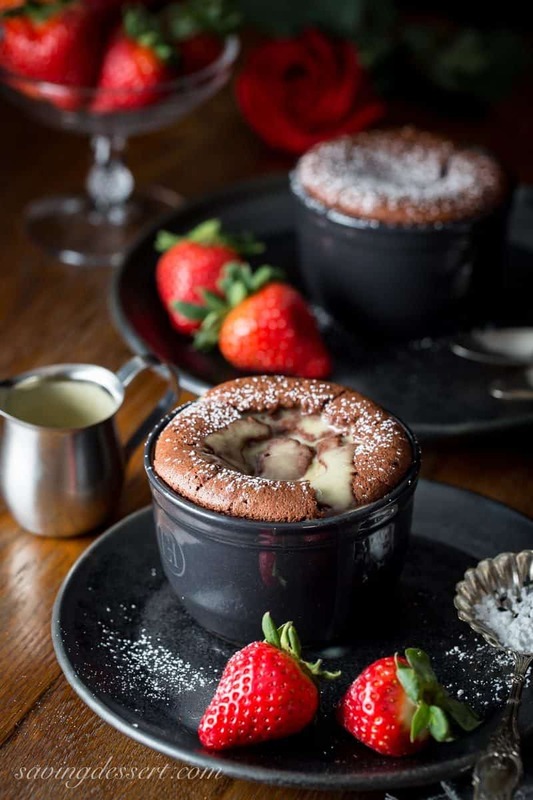 Light as air, and melt in your mouth creamy, our Chocolate Soufflé with Bailey's Crème Anglaise tastes luxurious and couldn't be easier to make! In a small mixing bowl, whisk together the egg yolks, sugar and salt until slightly thickened and lighter in color. Set aside. In a medium saucepan, warm the heavy cream and milk over medium heat just until steaming but not boiling. Slowly drizzle / pour half the warm milk mixture into the yolks while whisking continuously. 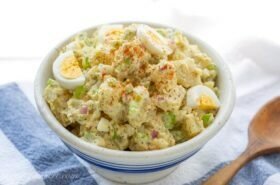 This method of tempering the eggs will keep them from scrambling. Pour the now-warm yolk mixture back into the saucepan, whisking to combine. Cook over medium heat, stirring constantly with a wooden spoon until the mixture thickens and coats the back of a spoon. This will only take a few minutes. Place a medium mixing bowl inside a larger bowl filled with ice (an ice bath). Strain the custard through a fine-mesh sieve into the medium bowl. Add the vanilla bean paste and the Bailey’s Irish Cream and stir to combine. Occasionally stir the mixture until it cools. Once cool, refrigerate for at least 2 hours before serving. Preheat oven to 375°F degrees. Grease three (5 or 6-ounce) or two (8.5-ounce) ramekins lightly with butter. Sprinkle the inside with granulated sugar. Invert and tap ramekins to remove excess sugar; discard. Set ramekins aside. In large heatproof bowl set over saucepan of hot (not boiling) water, combine 1 tablespoon butter, chopped chocolate, salt and 1 1/2 teaspoons water. Stir until the chocolate is melted. Remove from the heat and add the vanilla, cocoa powder and Bailey’s Irish Cream. Stir until smooth and well blended. Set aside. In a separate bowl, beat egg yolks with 2 tablespoons granulated sugar until thick enough to form long ribbons that hold their shape for 2 seconds when beaters are lifted, about 2 minutes. Fold into chocolate mixture. In separate bowl, beat egg whites (with clean, dry beater attachment) until foamy. Beat in cream of tartar. Add the remaining 1 tablespoon of sugar, a little at a time and then beat until stiff glossy peaks form; stir one-fourth of the egg-white mixture into the chocolate mixture. Fold in remaining egg whites until no streaks remain. Divide the batter between the prepared ramekins, smoothing tops. Run the tip of your thumb around inside edge of ramekins to wipe clean. Bake on rimmed baking sheet at 375°F until tops are dry and centers are still jiggly, about 12 minutes for the smaller ramekins, and 15-18 minutes for the 8.5-ounce ramekins. Dust tops with powdered sugar or unsweetened cocoa. Serve immediately with the Bailey’s crème anglaise. The crème anglaise can be made the day before and refrigerated until needed. Substitute the Bailey's with your favorite liqueur such as Brandy or another Irish Cream if desired. This recipe make 1 cup of anglaise so you'll probably have leftovers. 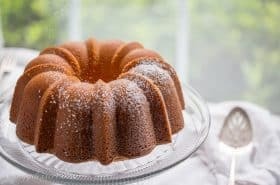 Drizzle on your favorite cake, scones, waffles or pancakes for a luscious treat. You can use any size ramekin you have on hand. Just make sure you fill them to about 1/4 to 1/2 inch of the top. This recipe was designed to use the 8.5-ounce ramekins so the batter fits perfectly. Adjust the cooking time if you use the smaller ramekins, 12 minutes should be about right. Another great dessert choice for a romantic dinner is our Molten Chocolate Cake with a tender, moist cake, a light crispy crust, and gooey rich chocolate middle. And we love this simple Chocolate Dulce de Leche Dip served with fresh fruit for dipping – such a fun dessert! Oh yay for chocolate souffle! I bet the hardest part was trying to snap pictures of it before it deflated. You did a beautiful job and now I’m really hankering for this! I almost made some for NYE dessert but defaulted to molten chocolate cakes (it always happens). You have reignited my craving. Happy upcoming Valentine’s Day! Thanks Susan – chocolate is my go-to romantic dessert 🙂 and yes it’s hard to stop scooping every last spoonful! I love a good soufflé! 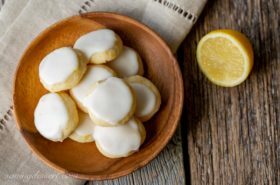 Haven’t made one in years, and you’ve inspired me — great recipe, and GORGEOUS pictures. And this is such a hard subject to photograph — you did an amazing job. Thank you John! Can’t wait to see what kind of soufflé you make! Not terrible at all Greg – that’s why there’s always options. 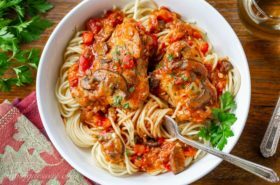 I love this sauce with brandy, rum or Grand Marnier 🙂 Maybe that will work for you! Trust you are well Tricia. Hi Mandy! So great to hear from you. Hope you are doing well too. Thanks for stopping by! My mouth is watering just looking at those pictures. I can just taste it with my eyes!!! YUM. Oooh, I made strawberry souffles last week. Bill loved them, but I know chocolate beats out any other flavor in his book. Yours are picture perfect! And I love the fabulous creme anglaise accompaniment. I always call this the chocolate season. But then again I think I call very season that! Especially if it means this was in front of me! It has been the chocolate season at our house for sure – more to come haha 🙂 Thanks Abbe! Gorgeous photos and a stunning dessert, Tricia! There is only one thing I have to disagree with. I can’t make the creme anglaise ahead of time….because I would eat it all before I ever got around to making the souffles! 😉 Truly special! Haha Wendy – this recipe makes one cup of creme anglaise so there is plenty to taste before serving the soufflés 🙂 Hope you are doing well – thanks for stopping by! Tricia..on my big screen..this ..these pics are supernatural..I love how BIG your blog pics are and of course how beautiful. Thanks Monique – the web designer set them up this big years ago – and I’ve often wondered if we should reduce them to a smaller size. They are big and in-your-face kind of photos! Thanks again. You and I could have quite a decadent party with our desserts today, and I agree with Angie, I’d pay big bucks for this in a restaurant! Very nice, Tricia! It looks delicious ~ delectable for Valentine’s Day! Bailey’s definitely makes everything taste better and this recipe is a keeper! Thanks! That’s what I was thinking Pam – thank you so much! Beautiful! Souffle is such a treat, especially chocolate. This would a perfect Valentines meal ender! Yes! We just love these soufflé Jennifer, especially with that sauce – yum! 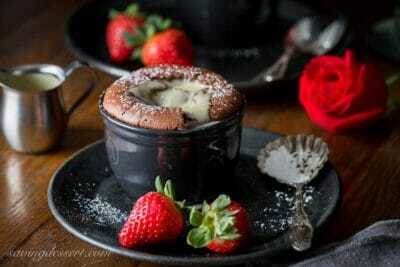 Wow, these photos are just beautiful Tricia and the soufflé looks amazing! What a wonderful special occasion dessert! Thanks Aimee – hope you get the chance to try it! That looks just like the one you see in the star restaurants! Thumbs up for you, Tricia.